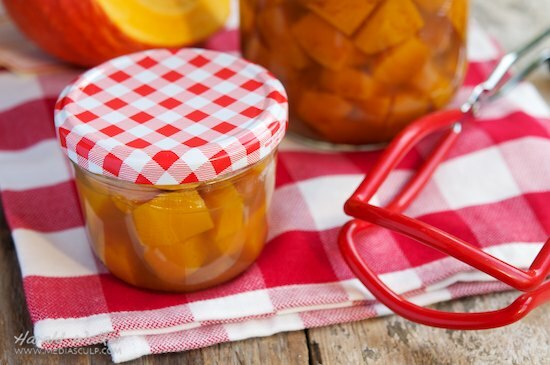 We found out about sweet sour pickled pumpkin last fall in Germany. There, they use the pickled pumpkin cubes in salads, as you would pickled beets and other tasty vegetables. We’ve been looking forward to making these ever since. It is a great way to enjoy pumpkins and winter squash throughout the season and adds a different dimension to fall salads. The pickled pumpkin is nice in a mixed green salad, and also mixes well with fruit and couscous. Cynthia of the Gherkins & Tomatoes blog has the traditional recipe on her blog. I’ve pickled one of our first harvested red kuri squashes and will be doing a few more later during the fall. Posted by Chris Walker on September 24, 2012 in Condiments, Pumpkin, Squash.